If you want to learn how to make pumpkin pie recipes, it is that time of year to get started. Soon we will be seeing the fields with a covering of bright orange. In October, parents and children will dig through the piles to find that perfect one for pumpkin carving. For this reason the big round orange pumpkins first come into our minds. Although these are grown primarily for Halloween jack o lanterns, they can be cooked and I have done so. They just do not have the flavor of some of the other ones. Like all orange pigmented vegetables, the orange pumpkin variety is rich in beta carotene. It is high in fiber and provides large amounts of vitamin C and potassium. If you are learning how to make pumpkin pie recipes, you will find the small orange sugar pumpkins are best for overall cooking. They are a little sweeter and have a better flavor for pumpkin recipes than the large orange varieties. Just cut off the top and bottom and scoop out the seeds. I then cut the pumpkin in strips and remove the peeling. Cut the strips into chunks and cover with a little water; simmer until tender. Drain any excess water and puree the pumpkin. Pumpkin halves can also be baked in the oven after scooping out the seeds. Pumpkins were an important food throughout the Americas long before Colonial times. Although most people throw out the seeds, when roasted they make a very delicious snack. To prepare the seeds, wash them thoroughly and dry them out. Bake the seeds on an oiled baking sheet for one hour at 250F degrees. The seeds are a good source of protein, fiber, iron, B vitamins and vitamin E.
Mix together all ingredients except the egg whites and coconut. Fold in the whites and coconut at the end. Pour into a nine inch unbaked pie shell (NOT GLASS). Bake for 10 minutes at 425F degrees. Reduce temperature to 375F degrees and bake 25 minutes longer or until center is set. Many people do not realize that pumpkins are also found in other colors besides orange. There is a red novelty type, a blue Australian one and a new white variety. 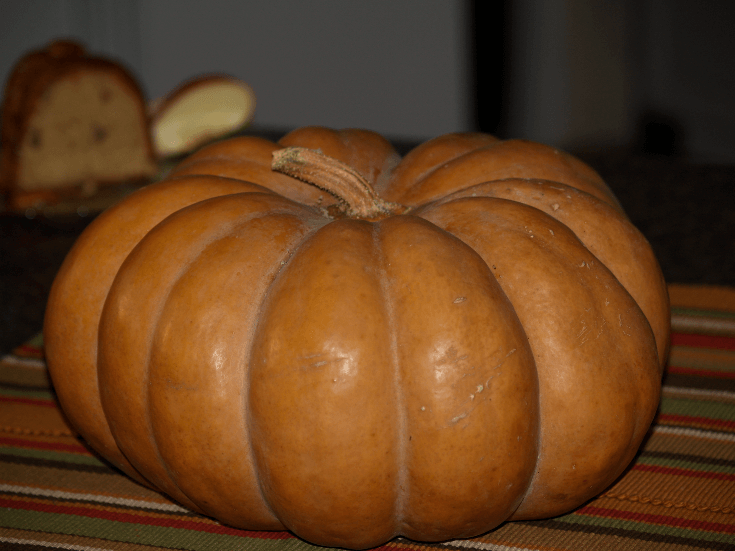 There is also a tan pumpkin which is used by most of the commercial canners which produce the cans of puree found in the grocery stores. Because of the availability of canned pumpkin, it no longer is necessary to make your pumpkin recipes only in the fall during the harvesting season and for Thanksgiving. When most of us think of cooking pumpkin we think of all those delicious sweet dessert recipes like pumpkin pie recipes, cake recipes, bread recipes and muffins. There are more pumpkin recipes than dessert recipes. 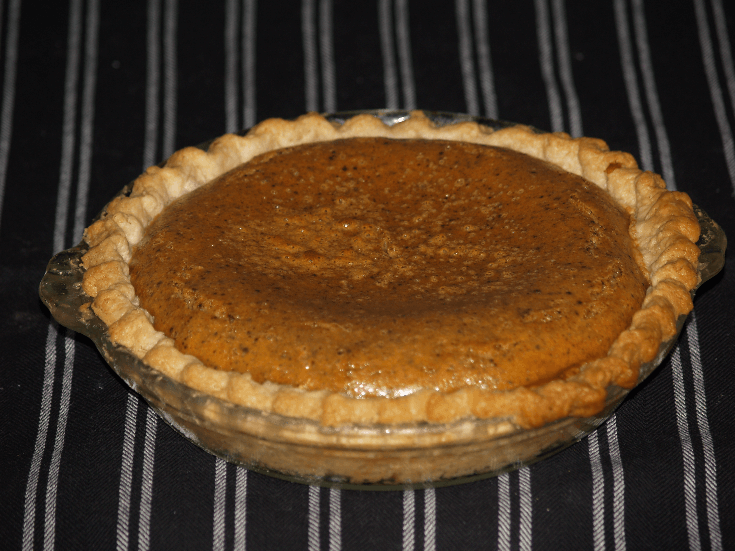 The following pumpkin pie recipe is a delicious vegetable accompaniment to any meal. 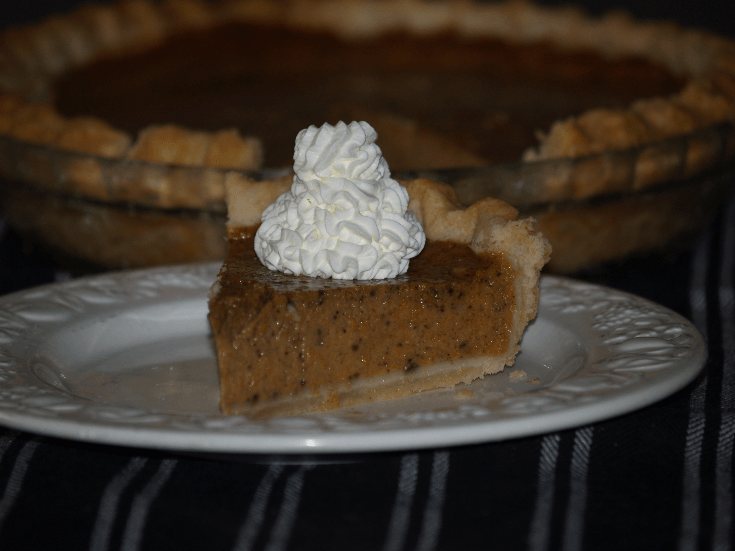 When you learn how to make pumpkin pie recipes you will want to try some of the hearty pies which make a great meal. Combine flour, salt and butter; cut in with pastry cutter. Moisten with water; work with hands until blended well. Work dough a little at a time into a greased 9 inch square cake pan on the bottom and up the sides. Bake the crust for 15 minutes. Reduce heat to 350F degrees. Heat the oil in a large skillet. Add the garlic and onions and sauté until tender. Add the corn and turn off the heat. Spoon the cooked pumpkin out of the shell and place in a large bowl. Cut the potatoes into small cubes and add to the bowl. Add the onion and corn mixture to the bowl. Add the onion and corn mixture to the bowl. Next add the grated cheese, thyme, salt and pepper. Spoon the mixture from the bowl into the pastry lined pan. Bake for 30 minutes. AT 350F degrees. This pumpkin pie recipe originated in New Hampshire. Prepare dough and line pie pan; do not bake. To make nut filling combine nuts, brown sugar, 1/3 cup maple syrup and 3 tablespoons butter in small saucepan. Cook and stir over medium heat until sugar is dissolved and nuts are glazed; pour into unbaked pie shell. To make pumpkin filling combine pumpkin, evaporated milk, egg yolks, 1 cup sugar, 2 tablespoons butter, cinnamon, pumpkin pie spice, vanilla and salt in a large bowl. Beat with electric mixer on medium speed until blended; pour over nut filling. Bake at 425F degrees for 10 minutes; REDUCE TEMPERATURE TO350F degrees. Continue baking for 50 minutes longer; sharp knife inserted in center will come out clean. Beat egg whites and cream of tartar until frothy; gradually add sugar while beating. Increase mixer speed to high and continue beating until stiff peaks form. Beat in maple syrup; spread stiff peaks over hot pie. 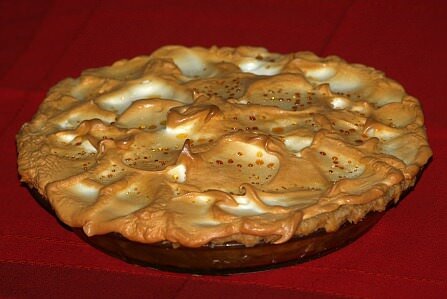 Return pie to the oven and bake until meringue turns golden brown. Set pie on rack to cool to room temperature; refrigerate. Spread ice cream evenly over top of cooled crust; place in freezer. Stir together in saucepan sugar, salt, nutmeg, ginger and cinnamon; stir in pumpkin. Cook over medium heat stirring occasionally until sugar is dissolved and mixture is warm; cool. Whip cream until soft peaks; fold into pumpkin mixture. Spoon into ice cream lined crust; freeze solid. To Store: Wrap tightly in plastic; soften to room temperature for 15 minutes before cutting. This pumpkin pie recipe makes a beautiful presentation. TO MAKE CRUST combine in large bowl the cookie crumbs, sugar and salt. Add egg white and butter to crumb mixture; blend well. Press crumb mixture over the bottom and up sides of 9 inch pie plate. Bake for 10 to 12 minutes until firm; set on rack to cool. TO MAKE FILLING in a large bowl beat with electric mixer on medium cream cheese and brown sugar until creamy. Add pumpkin, vanilla, cinnamon, ginger, cloves and salt to mixture; blend well. 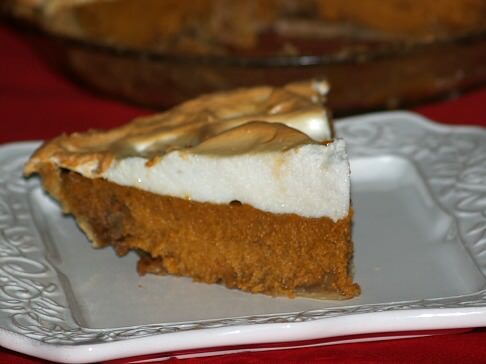 Fold whipped cream into the pumpkin mixture; spoon mixture into prepared crust. Refrigerate at least 2 hours or until set; serve cold, 8 servings. Learn how to make this pumpkin pie recipe with gelatin for a refreshing dessert. Soften gelatin in the coffee; in a saucepan stir together pumpkin, brown sugar and spices. Stir in softened gelatin; heat until dissolved. Add ice cream by spoonfuls; stir until smooth. Chill about 10 minutes until mixture mounds when lifted in a spoon. Spoon mixture into graham cracker crust; chill until firm. This recipe is said to have come from Log Cabin Holidays and Traditions. I think this is a cookbook but I am not sure. Combine eggs, pumpkin, sugar, salt, cinnamon, cloves, ginger and milk in large bowl. Mix until well blended; pour into pie shell and bake about 70 to 75 minutes. NOTE: Pie will test done if knife is inserted in center and comes out clean. Cool; cut and serve topped with whipped cream.